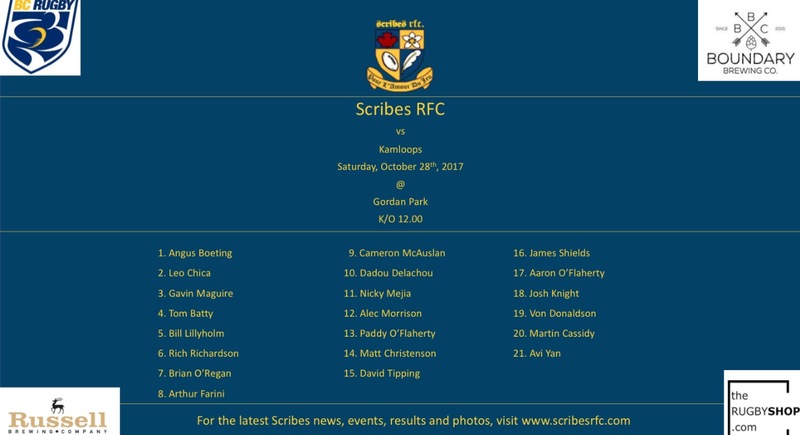 The Scribes Men will aim to make it two victories in a row, after a dramatic come from behind 22-14 victory over United RC last Satuday. This week’s opponents are the Kamloops Raiders, who toppled Scribes 42-17 in their last match-up. It should be a different beast altogether this time around, however, as the Scribes will have a much deeper bench of reserves to draw from on home turf. UPDATE: Kickoff at Gordon Park in East Vancouver has been pushed back to 1:15pm. The match will be followed by hosting at the Legion and then a Halloween costume party at The Dirty Penny. Injury update: Seb (and Angus) has been released from the hospital. Everyone at Scribes are wishing you all the best in your recovery.